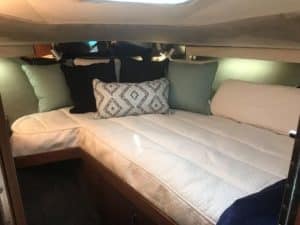 Boat beds come in all shapes and sizes, which can make finding comfortable bedding a chore. This Tiara 3100 Open has a new topper, boat sheets and bedspread to keep the cabin looking ship shape. Sheets that fit this odd shaped mattress keep you from getting tangled up at night and make the process of making the bed, much easier. The light color of the yacht bedding was a great choice to brighten up the stateroom. We have a great selection of retired model Tiara patterns on file, so ordering new bedding is just a mouse click away!